Useful information when protecting trademark rights in the Indonesia is presented below. It is our hope that our clients will find this page helpful in protecting their intellectual property overseas. 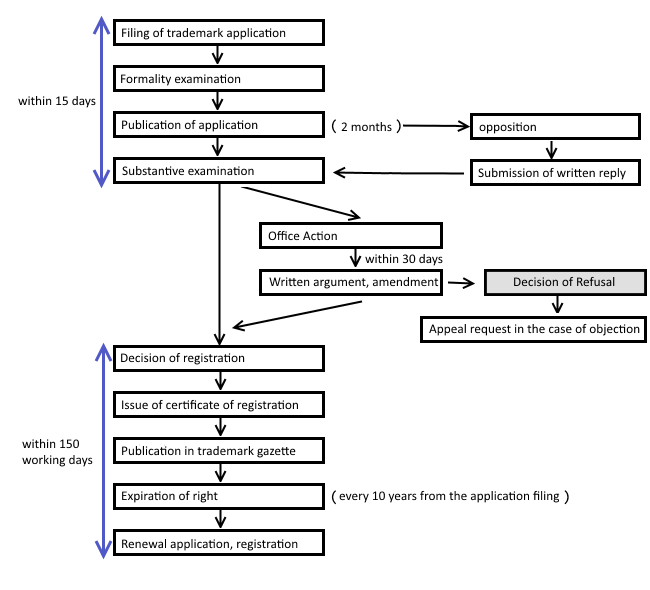 Through a law revision of 2016 it has been ruled that the substantive examination has to be concluded within 150 working days after the publication of the application. About 50,000 applications for marks are filed every year, and seventy percent of these come from within Indonesia. Among foreign applications, the greatest number comes from the United States. In Indonesia, many times people who do not own marks apply for the rights to them before the legitimate owners do. Apparently, many times former employees and former agents file these applications without permission from the companies that properly own the rights to them. If someone else has applied for a mark right before one’s own application of it, it is possible to file opposition. 1. The language of procedures is Indonesian. 3. A one application multi-classification system is adopted. ※three-dimensional marks, sound marks and holographic marks were added through a law revision. Filing of opposition to grant of a mark, removal of a mark due to disuse (arbitrated by the marks section), and revocation suits are possible means of ending a mark’s protection.